Wed., July 15, 2009, 4:48 p.m.
BOISE - Lawmakers from states and Canadian provinces throughout the Northwest are sending a sharply worded letter to the U.S. secretary of the interior and the Canadian minister of fisheries and oceans, seeking much more aggressive measures to contain quagga and zebra mussels once they’ve invaded an area waterway. The letter calls it “absolutely critical” that federal authorities move to contain and decontaminate boats as they leave Lake Mead in Nevada and other infested water bodies. It follows a similar letter sent by Idaho Gov. Butch Otter to Interior Secretary Ken Salazar a month ago. “Mr. Secretary, please seriously consider instituting within all U.S. Department of Interior agencies, including the National Park Service and the U.S. Fish and Wildlife Service, a mandatory decontamination requirement for ALL vessels leaving mussel-infested waters such as Lake Mead,” Otter wrote. Otter’s office said he’s not yet received a reply. Otter cited the case of the vessel “Hello,” which was the subject of a multi-state search after it was reported to be traveling from Lake Mead toward Idaho encrusted with the mussels. The boat was found and decontaminated in Spokane. 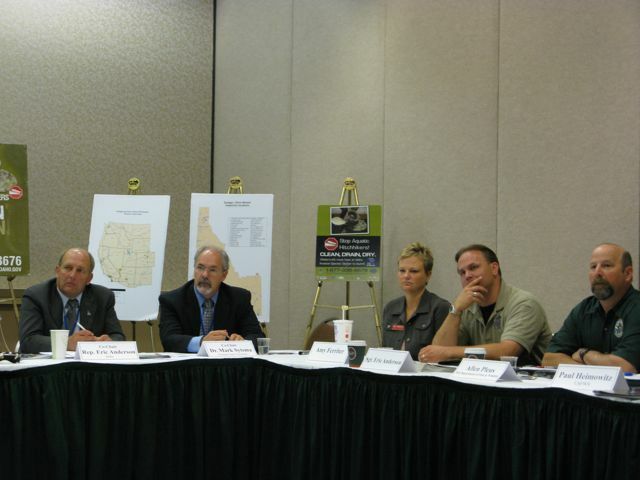 Idaho Rep. Eric Anderson, R-Priest Lake, co-chaired a session on the issue at the Pacific Northwest Economic Region gathering in Boise on Wednesday, and later the same day, the organization’s executive board agreed to send the letter. PNWER includes legislators from states and Canadian provinces throughout the Pacific Northwest region, and focuses on economic and environmental issues. “Whenever you can control an invader closest to the contaminated area, you eliminate the spider-web effect and trying to guess where they go,” Anderson said. For the National Park Service to bring the required law-enforcement presence to the area to accomplish a comprehensive inspection and decontamination program for all boats leaving the large lake, which spreads into part of Arizona, it would need a huge infusion of new funding - or to shut down most of the national parks in the West to shift resources, Heimowitz told the group. “The issue is resources,” he said. Anderson said it will cost far more to cope with the impact of the fast-reproducing mussels if they invade the waterways of more western states. In Idaho alone, the annual cost to maintain dams, irrigation equipment and other operations along waterways after a mussel invasion is estimated at more than $90 million. He said a federal action plan for coping with mussel invasions is nearly complete. It calls for coordinated state efforts to combat the invading shellfish. “The states are really the foundation for invasive species management,” Heimowitz said. Officials from several states said they’re aggressively targeting the mussels in prevention programs now, mainly through new laws, boat inspections and decontamination. “It’s a gross misdemeanor in the state of Washington if they blow past one of our stations - it’s a $500 fine,” said Sgt. Eric Anderson, the Washington Department of Fish and Wildlife aquatic invasive species coordinator. In Oregon, a new law prohibits the launch of any boat with any aquatic species on it. Randy Henry of the Oregon Marine Board said that’s an simple standard to enforce. A campground host or anyone else can “look at a boat and say, ‘There’s green stuff on your boat - please don’t launch it, or we’ll call the police,” he said. Montana identified and decontaminated a boat coming back from Lake Mead just last week. Published: July 15, 2009, 4:48 p.m.